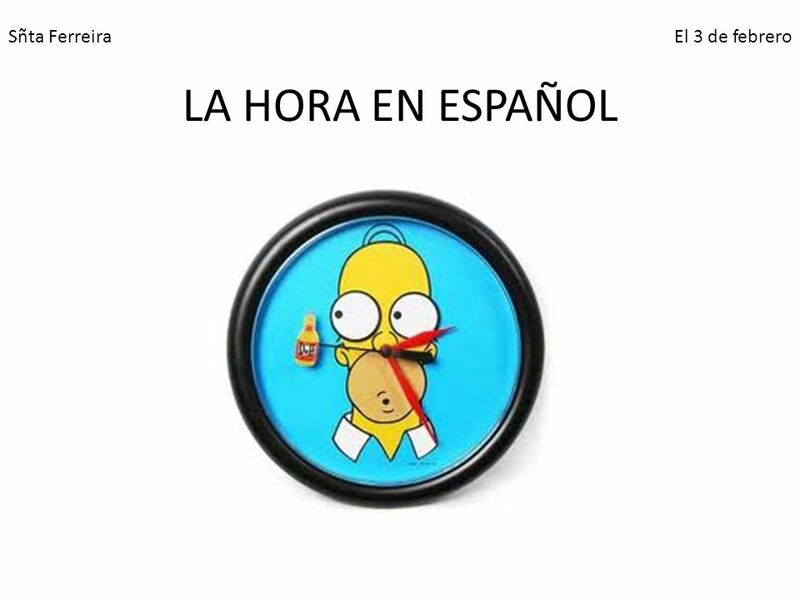 It is 1:00 o’clock -> Es la una. It is 2:00 o’clock -> Son las dos. It is 3:00 o’clock -> Son las tres. It is 4:00 o’clock -> Son las cuatro. It is 5:00 o’clock -> Son las cinco. It is 6:00 o’clock -> Son las seis. It is 7:00 o’clock -> Son las siete. It is 8:00 o’clock -> Son las ocho. It is 9:00 o’clock -> Son las nueve. It is 10:00 o’clock -> Son las diez. It is 11:00 o’clock -> Son las once. It is 12:00 o’clock -> Son las doce. 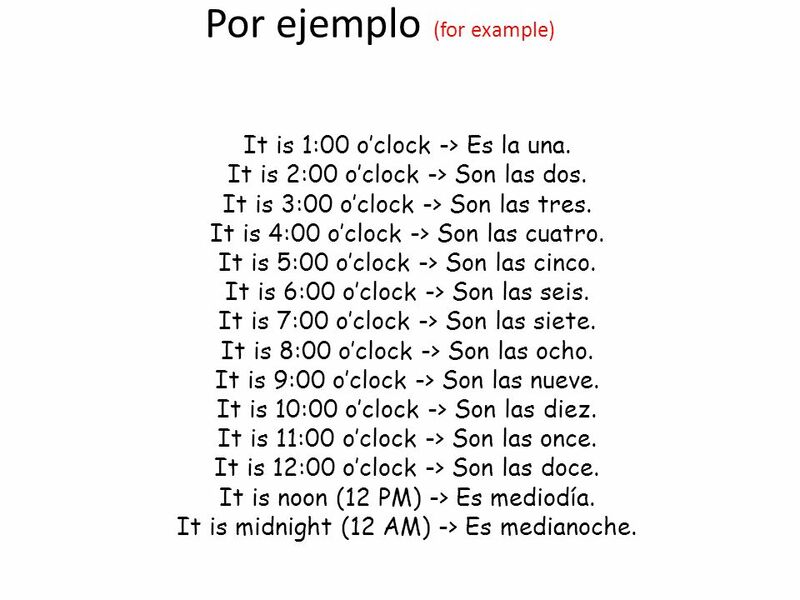 It is noon (12 PM) -> Es mediodía. 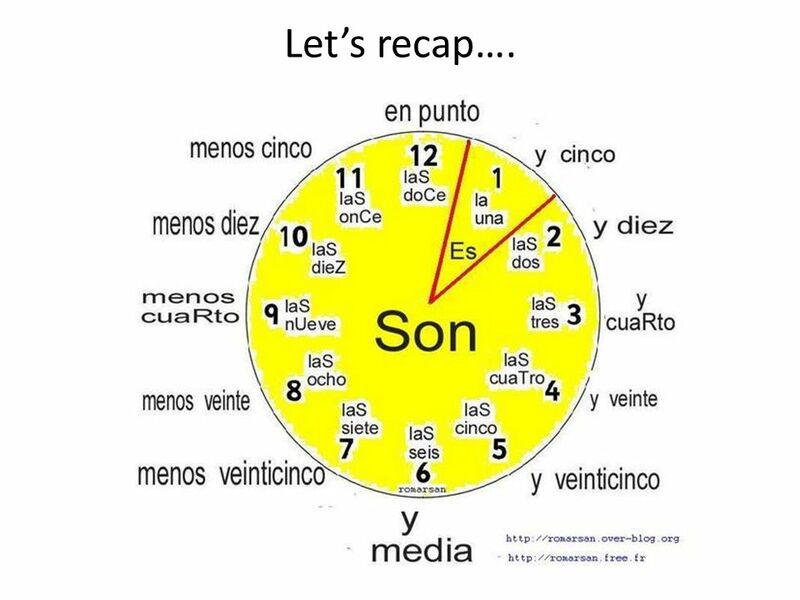 It is midnight (12 AM) -> Es medianoche. 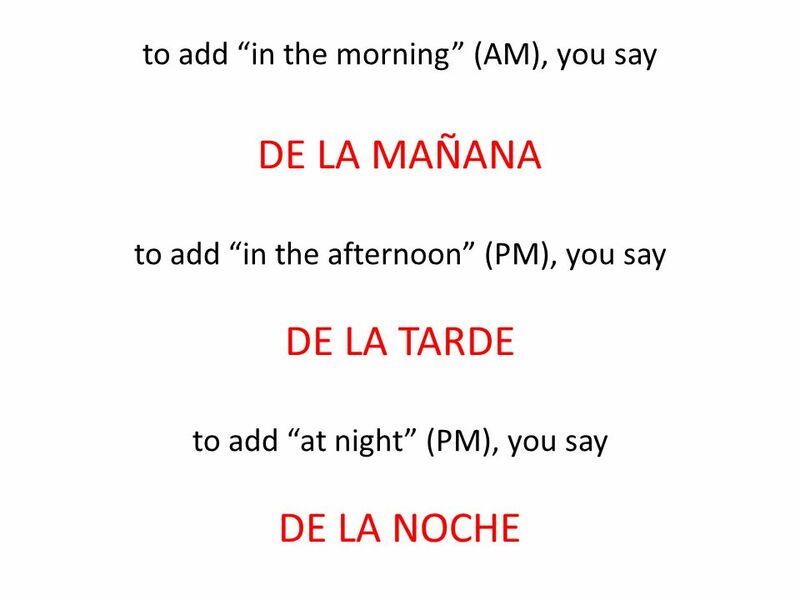 5 Por ejemplo: It’s one in the morning -> Es la una de la mañana. It’s one in the afternoon -> Es la una de la tarde. It’s three in the afternoon -> Son las tres de la tarde. It’s 11 at night -> Son las once de la noche. 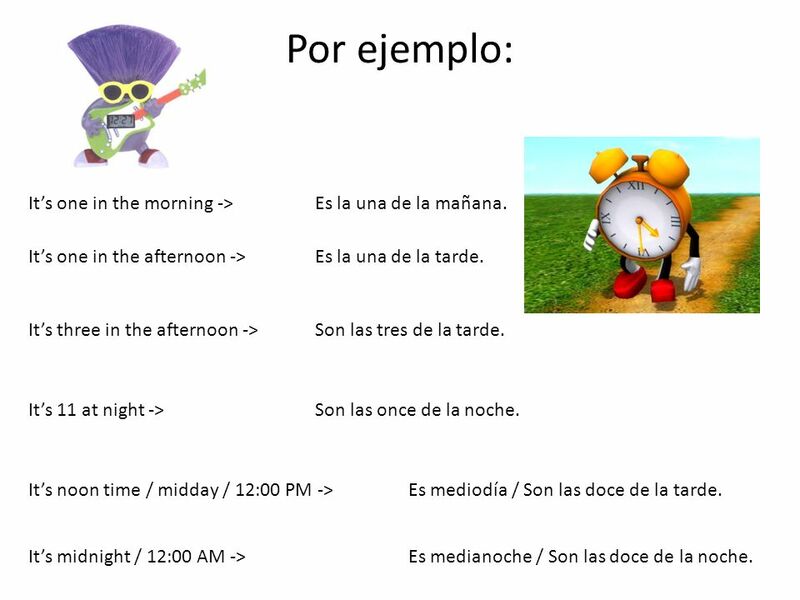 It’s noon time / midday / 12:00 PM -> Es mediodía / Son las doce de la tarde. It’s midnight / 12:00 AM -> Es medianoche / Son las doce de la noche. Por ejemplo…. 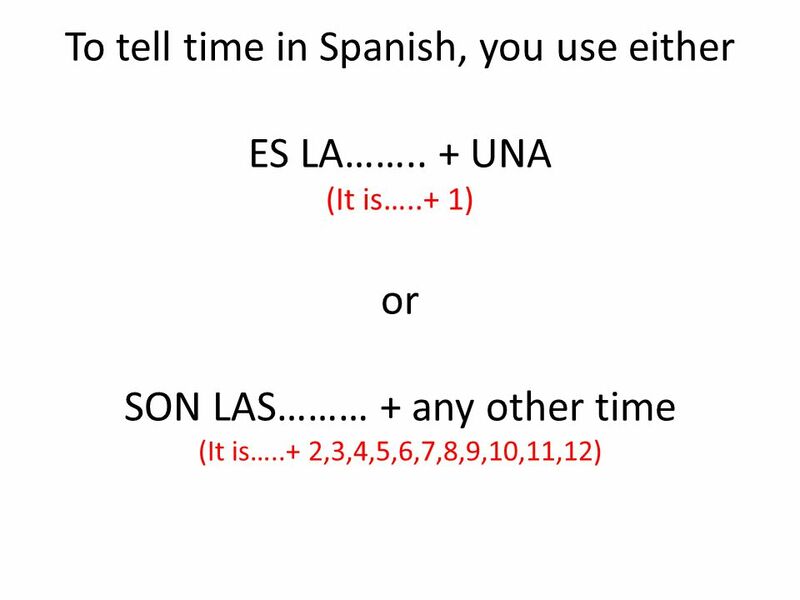 It is 1:05 -> Es la una y cinco. It is 2:10 -> Son las dos y diez. It is 3:15 -> Son las tres y cuarto. It is 6:20 -> Son las seis y veinte. It is 5:30 -> Son las cinco y media. Por ejemplo…. It it 10:45 -> Son las once menos cuarto. It is 12:50 -> Es la una menos diez. It is 8:40 -> Son las nueve menos veinte. It is 12:37 -> Es la una menos veintitrés. It is 7:55 -> Son las ocho menos cinco. 9 Ahora… ¡vamos a practicar! 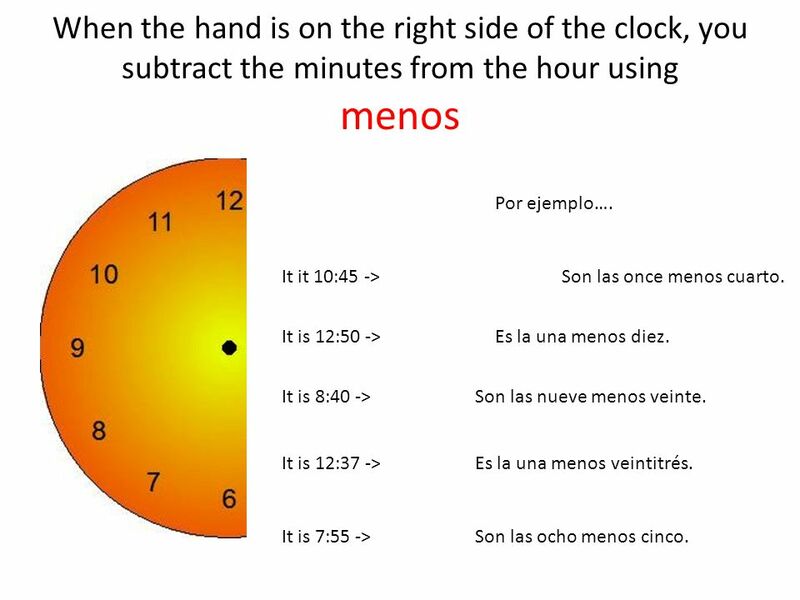 Come get a clock at Sñrta Ferreira’s desk and go with your assigned partner. Use the powerpoint handout if you need to. 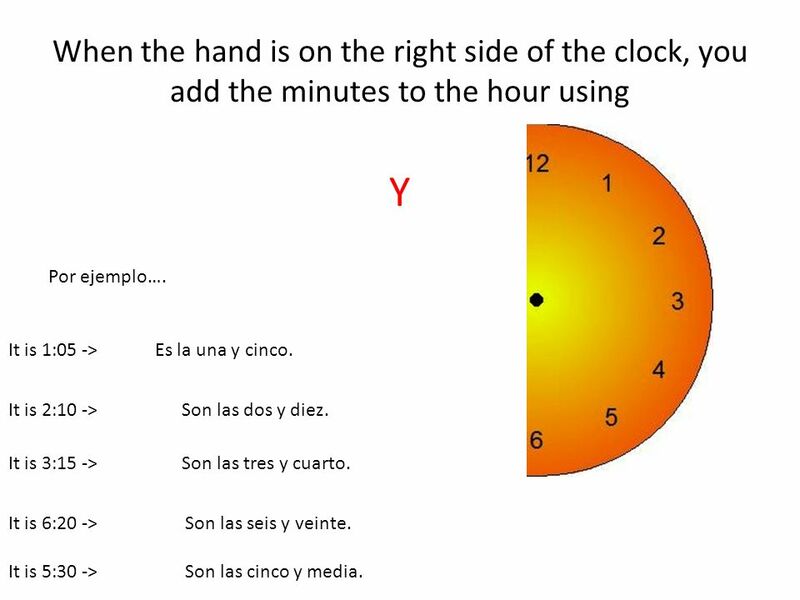 Show your partner 10 different times on the clock and ask him/her: ¿QUÉ HORA ES? Alternate asking and answering. When each of you has told time 10 times, start over with different times. Do not stop until Sñrta Ferreira says so. 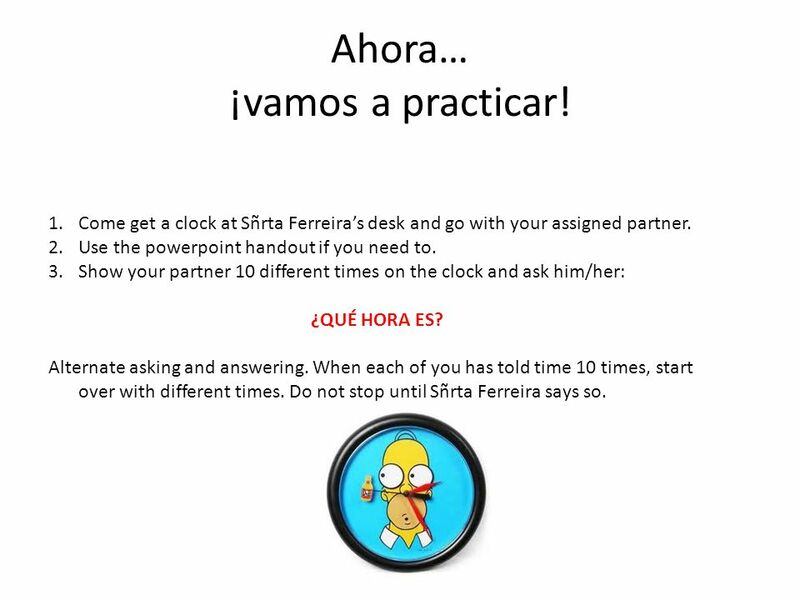 Descargar ppt "Sñta Ferreira El 3 de febrero LA HORA EN ESPAÑOL."